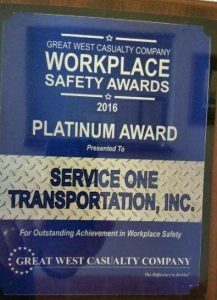 PLYMOUTH, Wis., May 24, 2017 /PRNewswire/ — Service One Transportation, a leading Wisconsin-based trucking and logistics company, was recently honored by Great West Casualty Company through its National Safety Awards and Workplace Safety Awards programs. 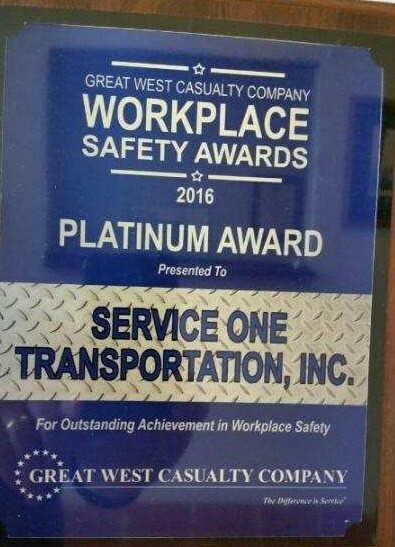 Service One earned a Platinum Award for Outstanding Achievement in Workplace Safety for the third year in a row, as well as a Silver Award for Outstanding Achievement in Highway Safety. Great West’s Workplace Safety Awards celebrate trucking companies that create and foster a safe work environment for their employees, as determined by year-end workplace incident rates, while its National Safety Awards honor motor carriers with the lowest proportion of year-end preventable crash results. Each program features Platinum, Gold, Silver and participatory awards. Service One welcomes safety-minded drivers with a Class A commercial driver’s license (CDL) to apply for available truck driving jobs. The company is presently hiring both over-the-road truck drivers and local/regional drivers, and is also seeking additional dock help for the busy summer season. To learn more about Service One Transportation, its available truck driving jobs in Wisconsin, and its full suite of benefits, visit https://www.serviceonetransportation.com/truck-driving-jobs. Service One currently has openings for both company drivers and owner-operators, and also offers part-time, seasonal and new/student truck driver jobs. In addition to excellent per-mile pay and full benefits, Service One features family-friendly policies and perks including a Family Passenger Program and pets permitted on the road. The Wisconsin trucking company welcomes applicants from its home state and surrounding areas in Illinois, Indiana, Iowa, Michigan and Minnesota. Headquartered outside Plymouth, Wisconsin, Service One Transportation offers a full range of trucking and logistic services—including truckload, volume less than truckload (LTL) and expedited shipping—throughout the 48 contiguous United States and all Canadian provinces. Dan Flagstad, Sr. founded Service One in 1997 with a single truck; today, Dan Flagstad, Jr. oversees the family-owned and operated business, which now employs more than 50 drivers. The Wisconsin trucking company has earned a reputation for unsurpassed customer service and is dedicated to “doing whatever it takes to get the job done right.” Service One is also highly regarded among drivers, offering excellent pay, full benefits and a “family-first” culture that ensures a proper balance between work and family time. For more information on Service One Transportation and its trucking, warehousing, logistics and supply chain solutions, visit www.serviceonetransportation.com.